Left unchecked, my face produces an impressive amount of hair. How much beard can grow in a beard season? Also, will removal of that beard result in significant weight loss? The beard will have a measurable mass. Starting from a fully grown beard as shown below. 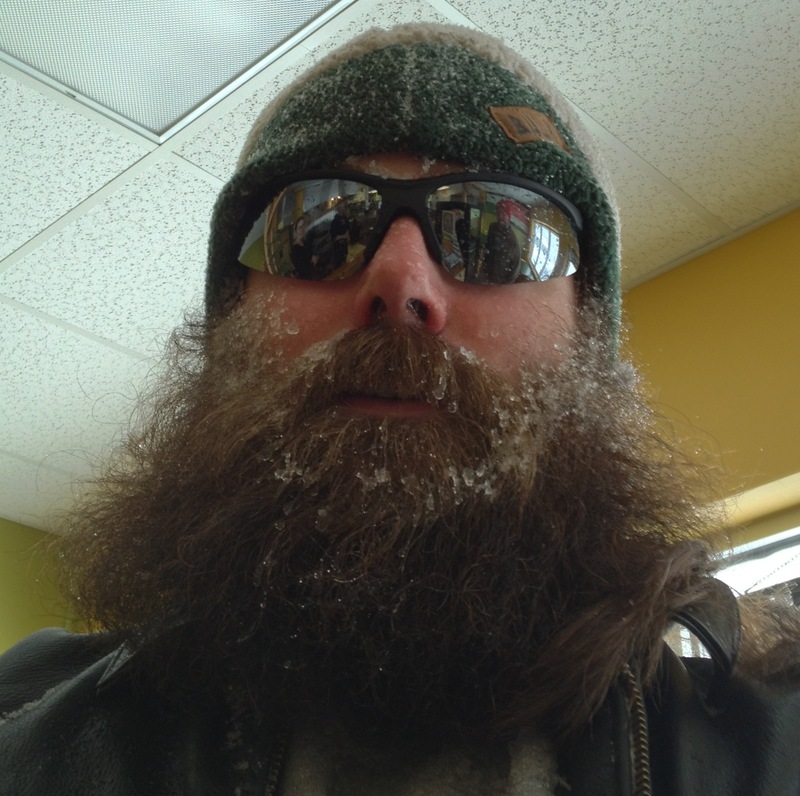 The nearly finished beard after a short trip to acquire a delicious burrito during a blizzard. A series of photos were taken before removing starting, and after each phase of removal. Multiple angles of the beard before any removal. Rough Cut: After removing the bulk with scissors. Rough Trim: After removing as much as possible using an electric trimmer with its guard on. Fine Trim: All thats left after a final pass with the electric trimmer withouts its guard. In addition, photos of the removed beard were taken before masses were measured. From these pictures it is apparent that the the bulk of the beard is removed during the rough cut phase. This is confirmed by comparing the masses after each phase. Beard collection bowl. a) Before rough cut, b) after rough cut, c) after rough trim. No photo of the fine trim was taken. 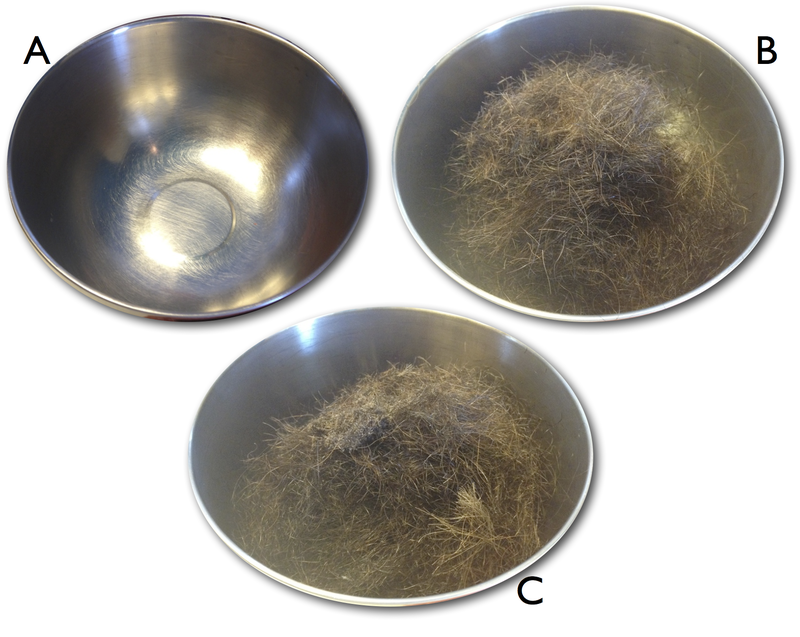 Before any removal, and after each phase, the bowl and its contents were massed, as shown in the table below. This gives an average growth rate of 53mg +/- 0.34mg per day. While no detailed timing information was recorded, the entire process took less than an hour, based on photo timestamps. The amount of additional hair removed during the fine trim was quite small, but still detectable by the scale. As expected, the beard had a measurable mass. However the total mass was only 12.5g (0.027 lbs. ), so this is not a very effective means of losing weight. If this measurement is repeated over multiple years, would there be any correlation with weather or age?